A guy purposefully ignores a woman who’s interested in him. You’ve seen this in romantic movies before, right? Doing this drives her crazy. Her desire increases. She has to find a way to win his heart. It causes her to pay a lot more attention to him. It causes her to engage in huge romantic gestures. And finally, she wins the heart of the guy she desires. This is not what I’m telling you to do. Why? Because it’s a Hollywood lie. Here’s what’s most likely to happen if you ignore the guy you like: he’ll ignore you back. Definitely not what you want. So you do not want to play hard to get. But you also don’t want to just fawn all over him. Because there’s something that works better. It comes down to human psychology and what we like. And while we are definitely attracted to people who like us, something attracts us more. The suggestion I’m about to make is based on a study. It was conducted on college students. The subject got to “accidentally” hear this description. And it greatly impacted how they felt about the experimenter. So which of those descriptions made subjects like the experimenter the most? As mentioned above, we like people who like us. So it’s not surprising that “all positive” descriptions got a positive response. But people liked the experimenter even more when they were initially negative but then became positive. In other words, when they were able to win the interviewer over. Because that means they did something to make the interviewer like them. Their actions mattered. Their personality mattered. It’s an ego boost that goes deeper than the surface. So how exactly do you use this to get a guy to like you? The idea is to let him overhear you talking about him to someone else. Which is crazy, right? How are you supposed to engineer that? I suggest something different. Tell him straight out. If it feels too awkward to do in person, send him a text. Or a Facebook message. Describe how you initially had negative feelings. You made bad assumptions about him. But now you realize that you were wrong. In fact, you really appreciate those things about him. The key is in the “negative to positive” transition. 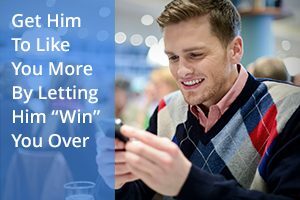 He doesn’t need to win you over. He already has. You’re just letting him see how. It’s sort of a hidden way to compliment him. Obviously, this is a strategy that works better with someone you know fairly well. Using it on a random cute guy in a bar won’t be easy! But if you happen to like a guy you know, it’s a great tool. It can serve both to boost his self-esteem and give him insight into your feelings. This entry was posted in Communication, Dating, How To, Relationships and tagged attraction, connection by James Bauer. Bookmark the permalink. WHY do guys PRAY for a girl …to finally meet her and then “GO GHOST?” Until he wants to see her the next time?